The head and hands are ceramic, the body is adobe concrete over fiberglass. The accordian is found object, and the pedestal is adorned with textiles. 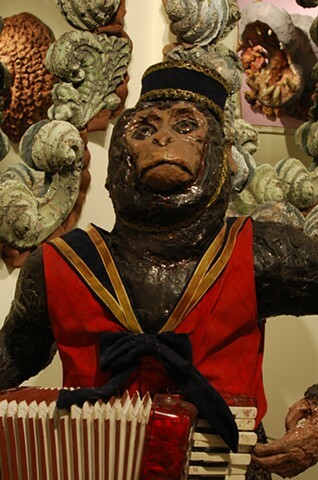 The vest on the monkey was made to fit the sculpture. In the background are 2 mirrors, "Spectacle". In the reflections, Silent Scream and Insatiable are seen.